We all imagine it, think about it, wonder at times and let our minds conjure up images of our perfect garage complete with a dream car collection. Some have exuberant visions of multi-storey luxury spaces that border on being little more than massive living rooms with a mix of furniture and cars. Others are more practical and think about more accessible and functional garages. I’m pretty sure Daigo Saito belongs to the latter group. 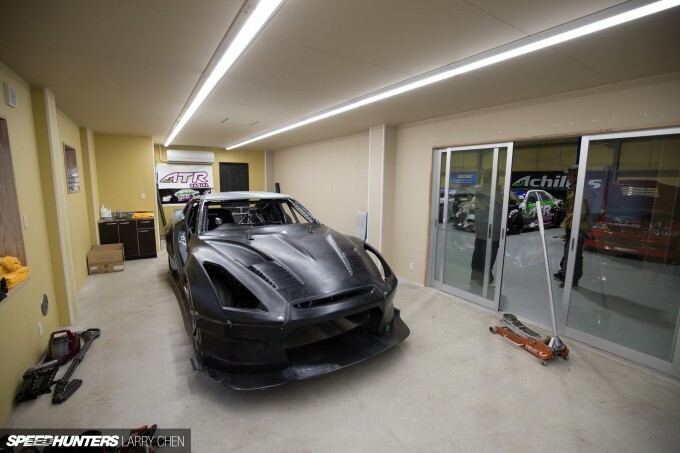 When Larry and I had the chance to stop by his place and check out the how the build of his new Formula D R35 GT-R was progressing, we got a little side tracked. 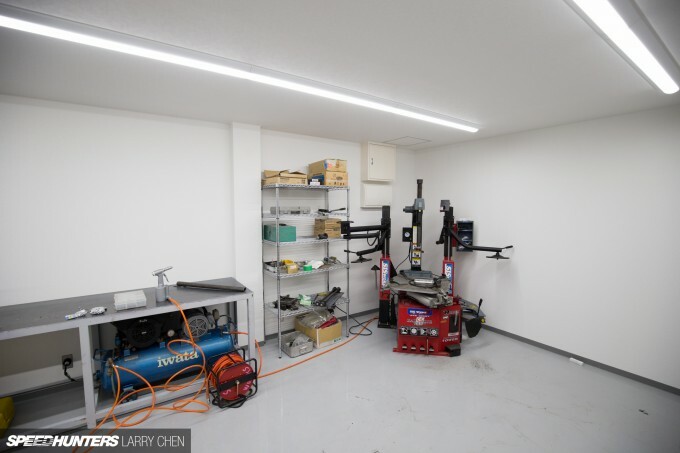 Robbie Nishida had told us that Daigo’s new man cave was really big and cool, but we just didn’t expect things to be quite on scale of what we found. Before I go on, bear in mind this is a personally-owned, private garage – not a tuning shop, nor a business, so in that respect it’s very unique indeed. We actually had a little trouble locating it, but after a quick call to Robbie, we found our bearings and arrived soon after. 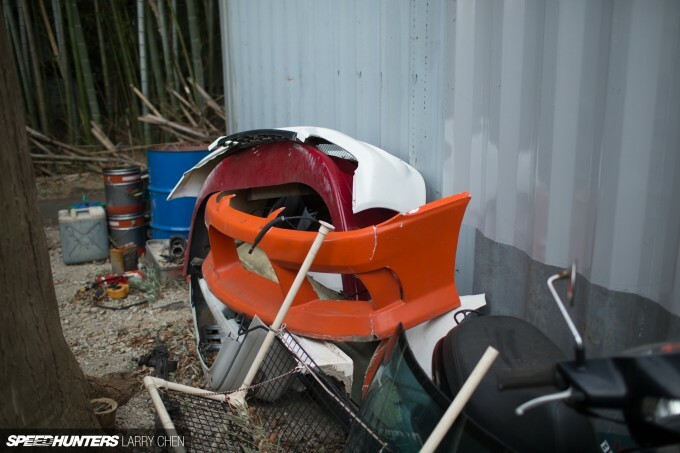 We knew we were in the right place too, as on one side of the property was what looked like a drift car junkyard! You name it – it was out there! 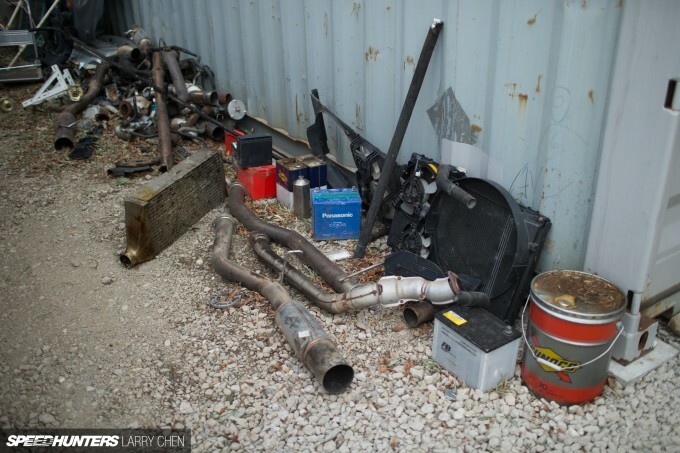 Daigo practices a lot, so it made sense to find so many cars and parts around, but the amount of stuff still shocked us. Many of the Toyotas sitting outside appeared to have been used as donors for engines, gearboxes and other spare parts, but it was pretty impressive to see so many of them stored like this. I wonder, has anyone ever seen Daigo drift the red Supra? 1JZ and 2JZ donors everywhere! And even a Cadillac?! That wasn’t the only American car there either. Larry spotted this Viper sitting on top of one of the many containers dotting the perimeter, and he had to get a closer look. 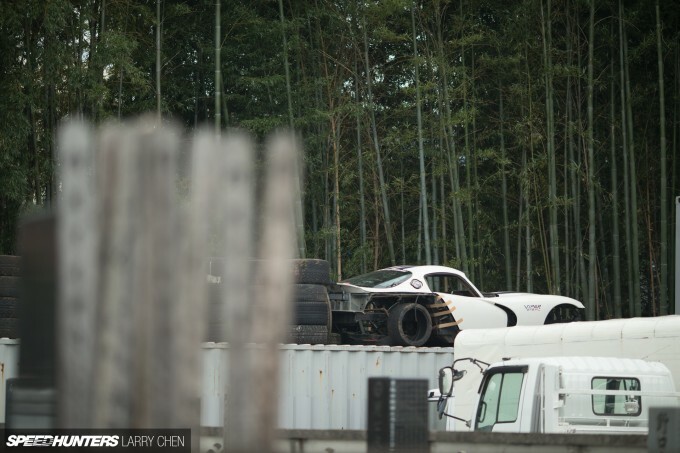 Daigo is well known for picking up cars in the States and shipping them back home to Japan, but this Viper is one that was supposed to have been turned into a D1 car back in 2013. A NASCAR-sourced V8 was supposedly going to power it, but as we can see here, the project has seemingly yet to take off. 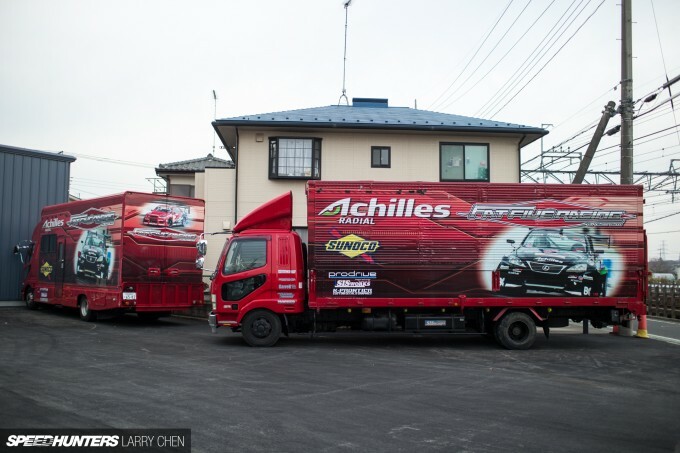 Given the number of international competitions that Daigo enters in, it’s not surprising to see that he keeps a few containers handy to the garage. When not in use they make excellent storage units I guess. If you see a beaten up car running on brand new Prodrive wheels and fresh Achilles tyres, it’s without a doubt one of Daigo’s missiles. I recall him one having a black JZX90 that he used for Drift Matsuris at Ebisu circuit, which looked a lot like this Mark II. The JZX90 – like many other practice cars – got pretty smashed after a few too many close encounters with the Minami course pit wall. On top of the Mark II was a JZX100 which I’m pretty sure Daigo used in D1 after a fire destroyed his main competition car. It’s so hard to keep up with what’s what as there have been – and still are – so many cars! 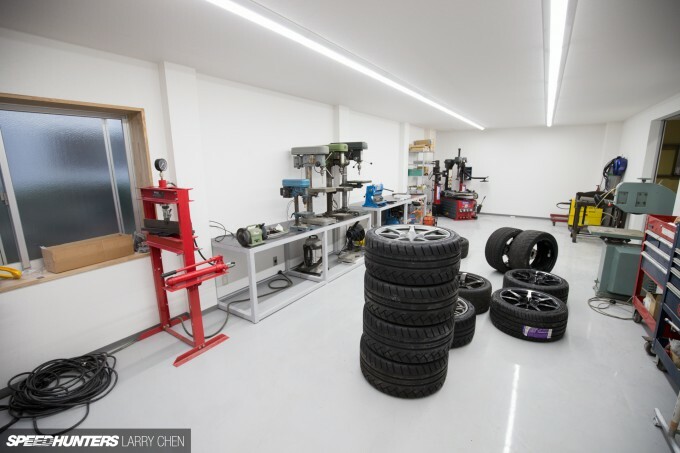 A garage is essentially what it looks like from the outside – very subtle and non-descript for obvious reasons, because – once again – this is not a shop but a pro drifter’s man cave! Larry headed around the back to see what he could find, and surprise, surprise, here there were a few more drift cars parked up. We were wandering around like kids in a candy store, but Daigo eventually came out and invited us inside. Seeing as the freezing air had penetrated most layers of our clothes, it was a welcome invitation. We’ve already had a good look at the Formula D R35 GT-R, but if you missed the first link you can take a look here. If this car wasn’t enough, since we ran the story a few weeks back Daigo has announced a partnership with Kato-san from Liberty Walk in which he’ll be running a modified version of the LBW Murciélago in the D1 Grand Prix. 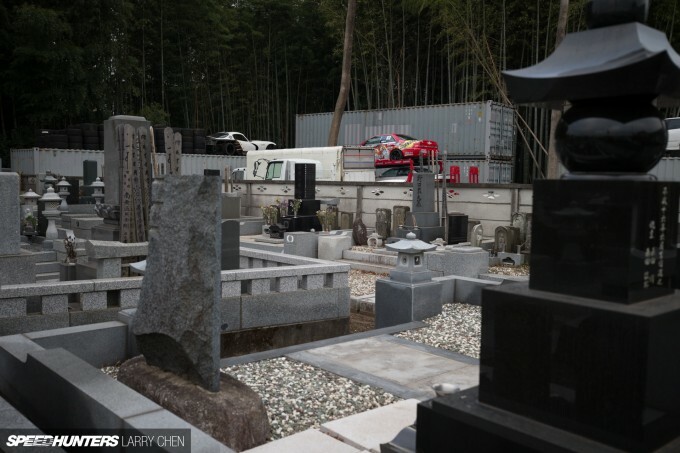 That should be very interesting, especially considering that Imamura will be driving the NASCAR V8 powered Lexus LFA… By the way, the Murciélago being used is Kato’s personal car – the same one he took to Italy for Lamborghini’s anniversary celebrations. Next to the little heated work area where the R35 is being put together is the main garage space. And boy is it big! All of Daigo’s drift cars from various series are kept here – in this shot the new JZX100 he used at Formula D Japan in Okayama right next to the Formula D Lexus SC. It’s so incredible seeing all these wild drift machines stored under one roof, and it only goes to show just how many crazy cars Daigo has built and driven in competition over the years. As always, it’s a high-powered 2JZ that is at the heart of many of these cars; most buried deep into modified firewalls and dropped as low as they can possibly go. 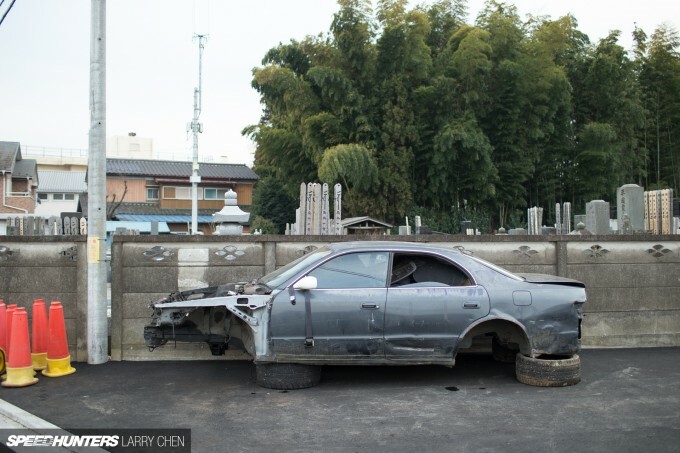 One thing that Daigo has managed to do is introduce a whole new forward way of thinking when it comes to putting together pro drift cars in Japan. Before he came along things almost stood still for championships like D1, but Daigo’s cars and style of driving have really pushed everyone else to evolve. I really like this 2JZ-powered Altezza, which we first saw driven in Formula D Japan at Fuji Speedway in July last year. The collection continues, and along with his own machines Daigo also looks after a lot of other cars that his friends use in either D1 or Formula D.
Along with the Viper we saw on top of the container earlier, this is another ex-US car that Daigo has purchased but has yet to drive in a pro event – Samuel Hubinette’s SRT8 Challenger. Having shot so many images of it back in the day, Larry got very excited seeing this car again. You may have already spotted the military green Liberty Walk GT-R parked in the middle of the garage. This car was unveiled at the Tokyo Auto Salon and will be Robbie Nishida’s new D1GP car for this year. 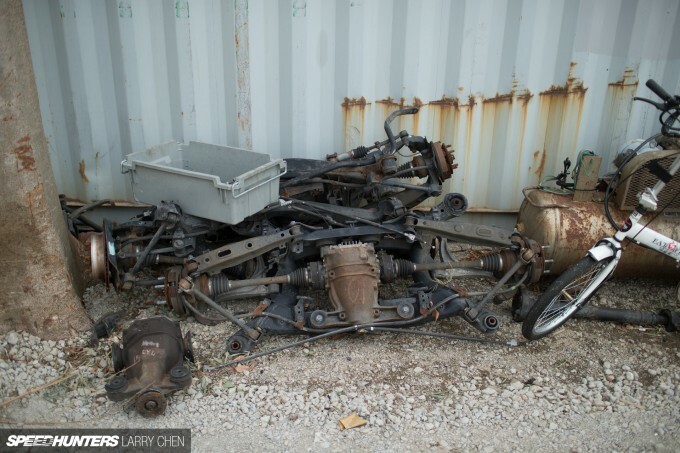 Not far from that we spotted what seemed to be another JZX chassis stripped down to bare metal. It looked like most of the interior section had already been put through a thorough dose of spot welding. Daigo has so many project on the go it’s almost hard to keep up! 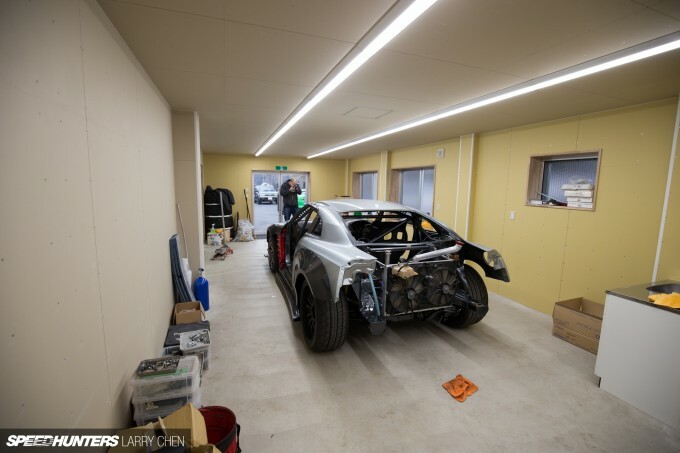 At the bottom of the big garage there’s a recessed area that’s currently being used as storage for many of the parts and materials that are being used in the Formula D GT-R build. 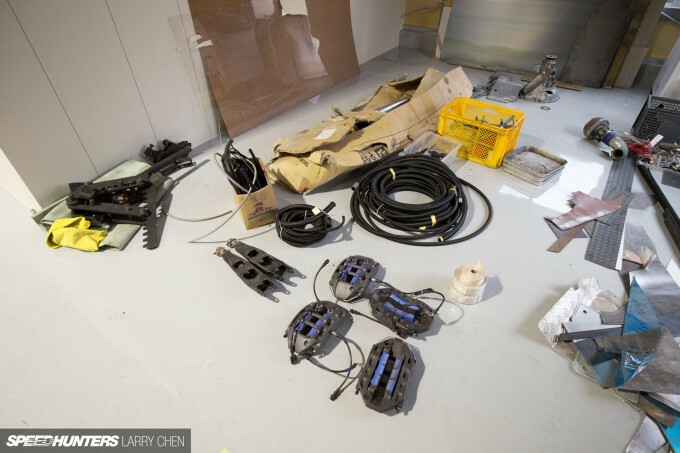 I spotted some 6-pot Endless monoblock callipers sitting on the floor. They’re R35 size, but which two cars in the garage will be getting these? That’s the question! 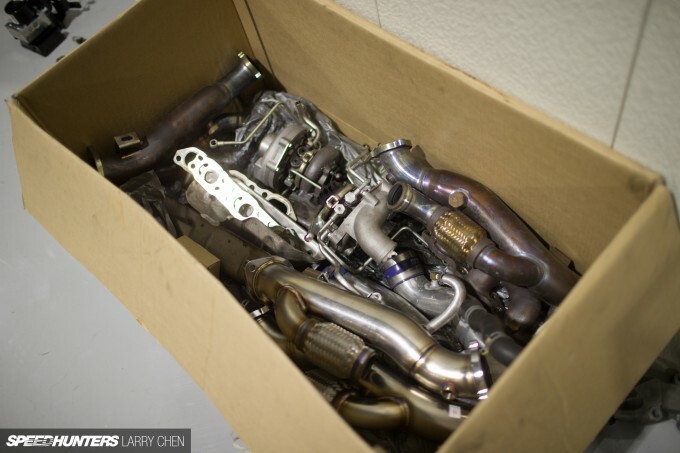 This is the ‘exhaust’ box. 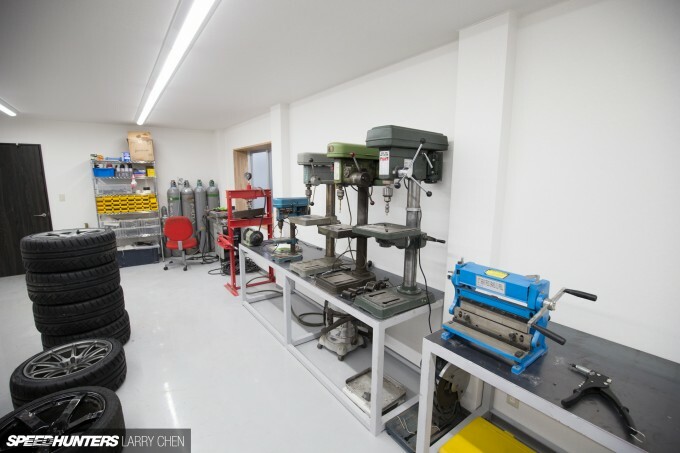 The building may have only been recently completed but the workshop area was already pretty well stocked up. Of course, one of the first pieces of machinery that any pro drifter needs is a tyre mounting machine! It’s all taking shape in here with a series of drills and presses being added – the bare minimum needed to rework sheet metal. It’s quite a big space, so I’m sure that this area will be filled up with a lot more equipment as time goes by. I haven’t commented on it yet, but have you guys seen that epoxy treated floor! Clean enough to eat your dinner off off! 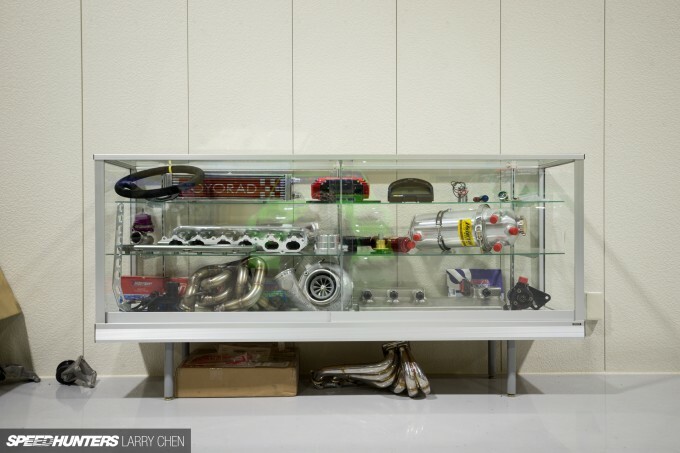 Back out in the main garage space we spotted a little display cabinet filled to the brim with a lot of cool parts, including a Koyorad oil cooler, Racepak dash display and a Hypertune billet intake plenum for a 2JZ. If you are going to invest in a serious tool cabinet, then make sure it’s got some wheels so it can be moved around! 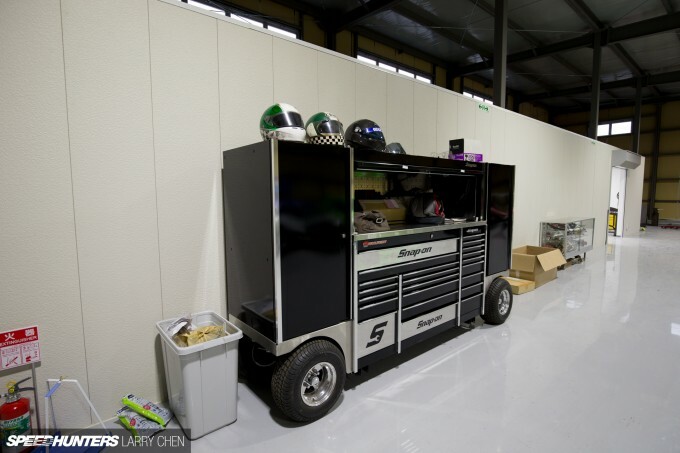 The black Snap-on cabinet also doubles up as a place for Daigo to display his helmet collection. As Larry and I were left to wander through the garage and check out every car in detail, Daigo was busy designing the new livery for his Formula D GT-R.
Larry still couldn’t believe Daigo’s decision to run 21-inch wheels, so we rolled one of rims and put it against the 20-inch one the car was fitted with. It just fits in there! Not wanting to take up too much of Daigo’s time, we wrapped up out visit – but only after a few last shots.. I’ll be heading back to Daigo’s place in the upcoming months once he completes his GT-R and maybe to shoot a few other cars he has ‘sitting around’ – most importantly the JZX100 he used in FD Japan. Stay tuned! Just when you think you've seen it all, there's (most of) a Viper on top of a shipping container in a backyard. In Japan. awesome waiting on that new r35 build.... great work guys!!! LFA, R35, Lambos? 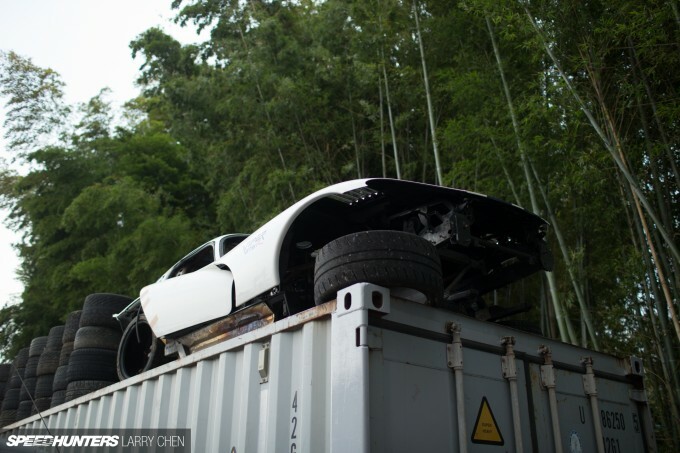 It seems that Drift has gone a little loopy, first it was 1000hp drifters now $1million drifters. Whats next, someone drifting a McLaren P1 or LaFarrari? 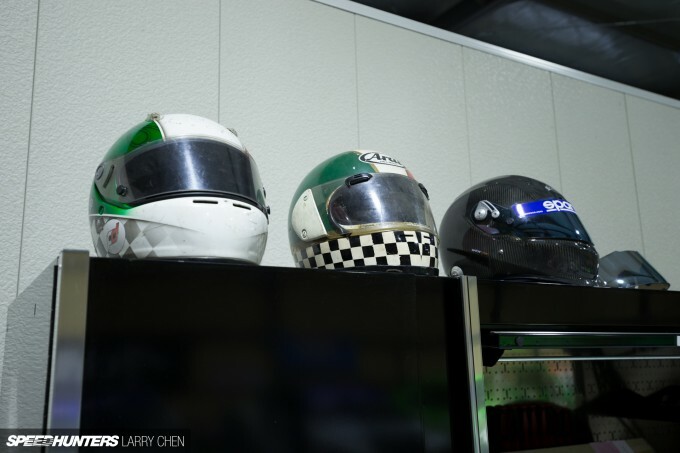 Speedhunters HOLY MAN CAVE. 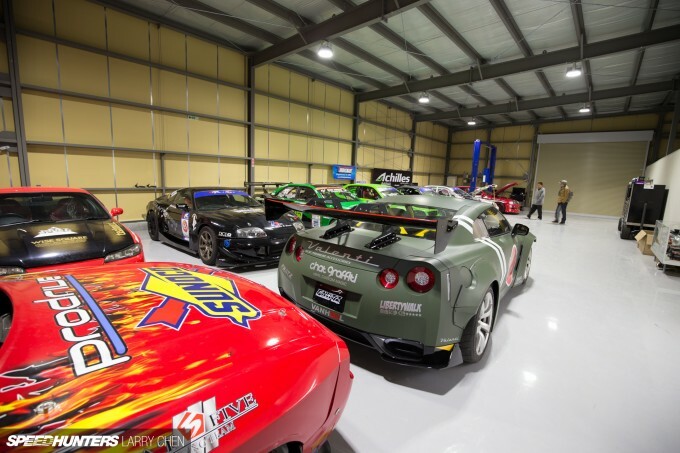 Daigo is one lucky guy to have a awesome collection of cars. Plus a Lambo in D1 WTF. Great place and very peaceful neighbours too. I just realize there is 2 Cadillac CTS ... the wrecked front end car , is also CTS . What is the CTS doing there ? Larry Chen Dino Dalle Carbonare, can either one of you guys do a feature on his Formula D Lexus SC? butiful garage and all thoes cars! oh I wish I could in on some of that action!!! Seeing that viper like that makes me really sad :(. Reminds me of the Gr.5 LB Celica in a junkyard a while back. 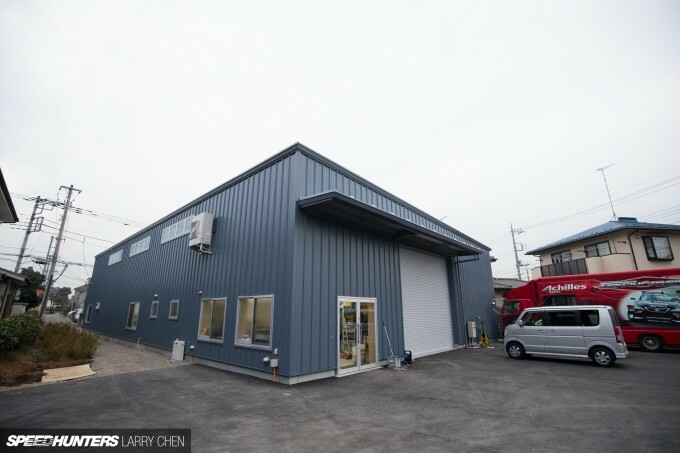 nice industrial warehouse.......where are the pictures of said "mancave"? Dino, next time you go back please ask him to fire up the Challenger. It's GLORIOUS. I saw Sam in it at Long Beach and the sound just gets better and better up to about 8000rpms or more. Chris 'Haffy' Hafner indeed. they are taking this WAY too far. Chris 'Haffy' Hafner I like it. Someone has to push the boundaries. 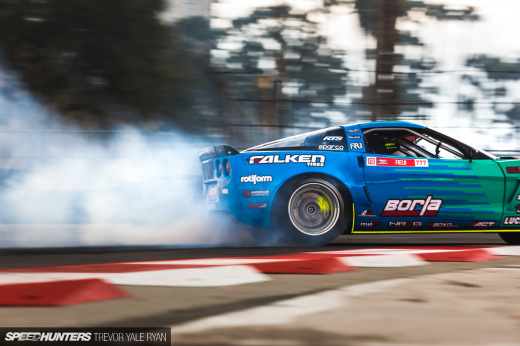 Drifting has never been about keeping everyone happy or being 'PC' about things. It's about having fun, pushing the limits and finding out what you can get away with. 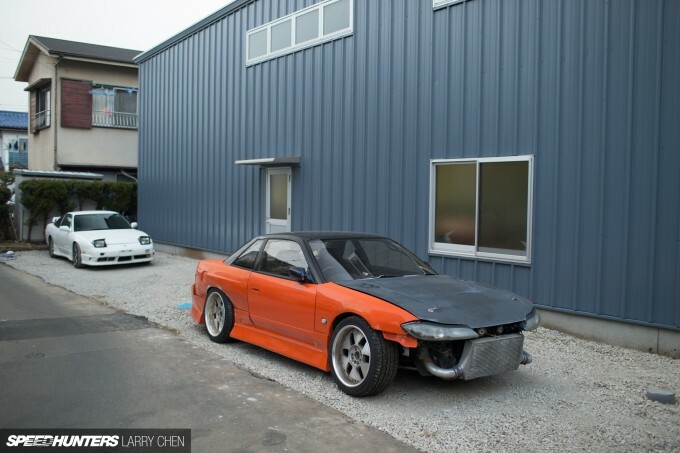 Don't get me wrong, I wouldn't want these exotic builds to become the 'norm', but I'll definitely get a kick out of seeing a GTR/LFA/Lambo going door to door with an S-body or FRS. I wonder how rich is Daigo. I know that space is scarce in Japan and this is airport like garage. And the cars....wow. When featuring Daigo`s GTR, dont forget to feature mr. Nishida`s GTR too! The fighter plane livery looks amazing! 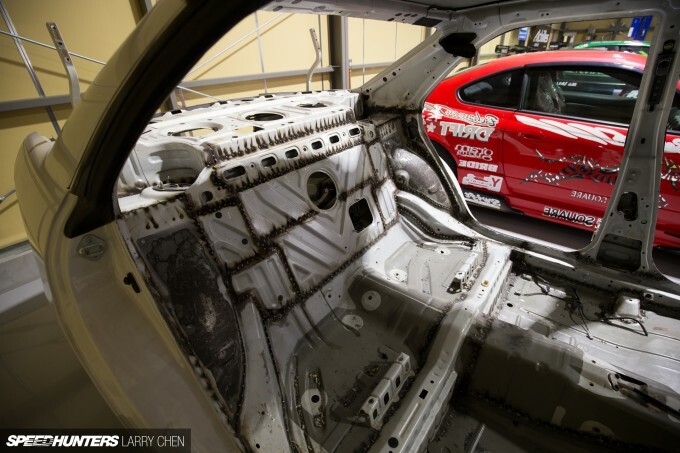 One aspect of sustainability that many people overlook is proper recycling of cars. 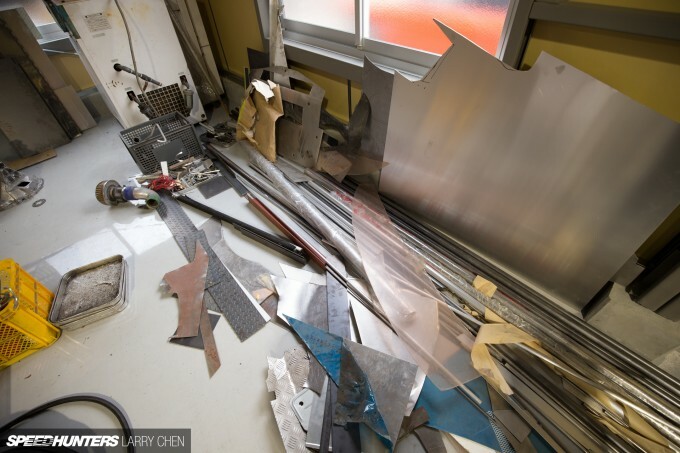 If you have a junk or scrap car, it’s much better for the environment to let the experts have it- the metal will be crushed down and recycled to make new products. http://caracceptance.com/need-to-sell-my-car/ helped me http://www.caracceptance.com/need-to-sell-my-car, and I felt great knowing I had chosen the eco-friendly route. Spartan2020 why scrap the car when you can add it to a collection. Lets be honest, drifters dont really care about environment right? and its pretty obviouse why. the first chapter just hurt me very bad, in Germany you have to spend a fortune to get your hands on a japanese chassis which is in a decent condition, and this guy just has dozens of them standing there haha. CharlesChris15 Spartan2020 A car sitting in a collection is better for the environment than spending a ton of energy reclaiming the materials. Energy is bad. Metal/plastic etc. isn't. A guy can only drive one car at a time so he's only able to use one cars worth of energy. Building new parts instead of using old ones is the dumbest use of energy ever. We should work on keeping our cars alive as long as possible. Great article! The thing that stood out most: Dino's gorgeous R34 sitting outside the shop in one of the pictures! You say man cave but I know for a fact there are plenty of girls that would cream themselves over that stable, lol. I guess he gave up on the Ferrari? 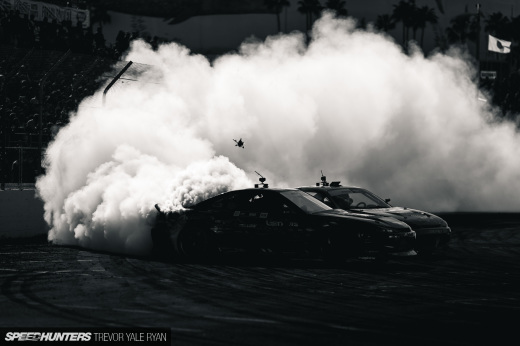 D1RGE Yeah the Challenger is insane in person, I remember standing right on the fence at Drift Shifters in 2012 with this tearing past, such an incredible sound.
" 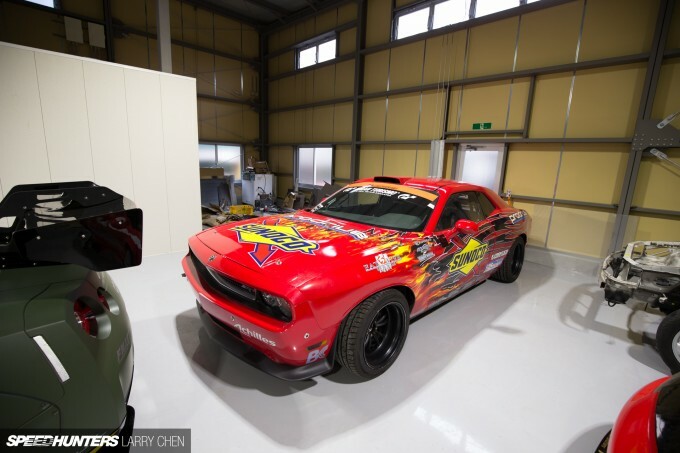 If this car wasn’t enough, since we ran the story a few weeks back Daigo has announced a partnership with Kato-san from Liberty Walk in which he’ll be running a modified version of the LBW Murciélago in the D1 Grand Prix." So jealous right now! Amazing set up. Dino tell me what does Daigo for a living to pay for all this? I'd really think about hiring a good editor and chief. Every article I read has at least a dozen grammatical errors. Let's step it up guys.